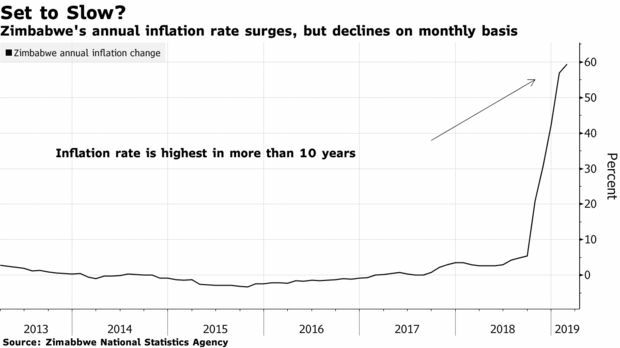 Zimbabwe’s February inflation rate surged to the highest annual level since hyperinflation more than a decade ago, but monthly consumer-price growth is slowing. While annual inflation accelerated to 59.4 percent in February compared with 56.9 percent in January, prices grew 1.67 percent in the month, down from 10.8 percent in January, the Harare-based statistics agency said in a report Friday. Government efforts to contain price increases are showing a “real manageable trend in month-on-month inflation,” Finance Minister Mthuli Ncube said Feb. 21. “With further implementation, ‘month-on-month’ inflation could even reach close to zero by year-end,” he said in an opinion article published in the state-controlled Herald Newspaper. On Friday, Ncube said measures introduced in a Transitional Stabilisation Programme unveiled in October were starting to bear fruit and inflation is expected to ease further. Inflation in the southern African nation peaked at 500 billion percent in 2008, prompting the government to abandon its currency and adopt a system where the dollar is most commonly used. The central bank forecasts price growth of 10 percent to 15 percent by year-end, Governor John Mangudya said this week. Zimbabweans are in the midst of the worst economic crisis since the hyperinflation era as they face shortages of food, fuel and foreign currency.